Always nice to have a few overripe bananas to make some banana bread. I’ve had a number of recipes over the years, but this is my new favorite. My daughter pointed me to this recipe from the blog Running with Spoons. I made some changes and below is how I make it. I really like putting quick breads in smaller pans rather than one standard size bread pan. They seem to bake more evenly and just nice to cut the smaller loaves. 1 1/2 cups whole wheat flour (I usually use whole wheat pastry flour, but not necessary). Put flour, cocoa, baking soda, salt, baking powder and cinnamon in a medium sized bowl and whisk together. Put the eggs, bananas, yogurt, maple syrup, coconut oil, and vanilla in another bowl. With an immersion blender, mix all ingredients until smooth. Pour the wet ingredients in the dry ingredients and mix to just combine. Fold in the nuts and chocolate chips. Pour evenly into 2 well-greased small bread pans. (My pans are ~ 7.5″ x 3.5″). I also use parchment paper and just grease the small ends. Makes for an easy cleanup and the bread comes out so much easier. Bake for 33-35 minutes or until toothpick inserted comes out clean. Let cool for 10-15 minutes before removing from pan and cool further on a cooling rack. In trying to get more beans and fiber in our diet, I tried this Black Bean Brownies recipe. It is an adaptation from the book, “Spilling the Beans.” It got a thumbs up from the family and you’d have no idea there were beans in it. Rinse the beans and spread them out between some paper towels to absorb the excess moisture. Spread the pecans out on a baking sheet and put in oven to toast lightly (5-7 minutes). Watch them carefully. Set aside to cool. In a small pan, melt the chocolate and butter being careful not to scorch. Mix to combine and set aside to cool a few minutes. In a medium bowl, combine the flour, salt, and cinnamon. Place beans and cooled butter/chocolate mixture in a food processor and combine until smooth. Add the eggs, sugar, and vanilla. Pulse processor until combined. Add mixture to the flour/salt combining lightly. Gently fold in the chocolate chips and pecans. Do not over mix. Cool completely before cutting unless you want to eat this with a spoon. When cooled it is very moist and delicious!! I don’t have a picture for this recipe, but wanted to write it down so I don’t forget it! I’ve made it twice in the past couple months and it’s delicious! The garlicky sauce that the veggies and meat are mixed in is wonderful. My husband licked the pot clean when I made the sauce. The pie has one crust on top. You can purchase frozen pie crust in the grocery store, but if you have a food processor, it comes together in a couple minutes. I listed all the meats in the title, as it’s been made with all of them. Combine flour, butter, & salt in food processor. Pulse until crumbly. This is about 10 1 second pulses. Stir water and vinegar in a small bowl. Pour half the water-vinegar mixture in processor. Pulse to combine (about 8 1 second pulses). Pour remaining liquid in and pulse til it comes together. (8-10 1 second pulses). Sometimes I have to had a bit more water. Shape into a small ball, cover in plastic wrap and refrigerate until ready to use. This recipe makes enough to make a top crust of 13 x 9 inch pan. 3 cups chicken stock/broth (or use water to make 3 cups if not enough broth). 2 cups cooked chopped/shredded turkey, chicken, or pheasant. Make the filling: Heat the Olive Oil in a large pot. Add onion, potatoes, celery, carrots, thyme, & cayenne/crushed red pepper flakes. Sauté until tender crisp – about 5-7 minutes. Add frozen peas and add meat of choice. Set aside. Make the sauce: Melt 6 Tbsp. butter in a large skillet. Add garlic and sauté for a minute. Add flour and whisk until a thick paste forms. Add the stock one cup at a time. Whisk after each cup. Season with salt and pepper. Add to vegetable/meat mixture, stirring to combine. Finish it: Pour mixture into a greased 13 x 9 inch pan. Roll out your pie crust on a lightly floured board til it hangs slightly over the 13 x 9 inch pan. Finish the edges with fork prints or as you wish. Cut slits in the top. Put in 375 degree preheated oven for 30-35 minutes or until crust is lightly browned. Brush the warm crust with a bit of butter. Let stand 5-10 minutes before serving. Enjoy! 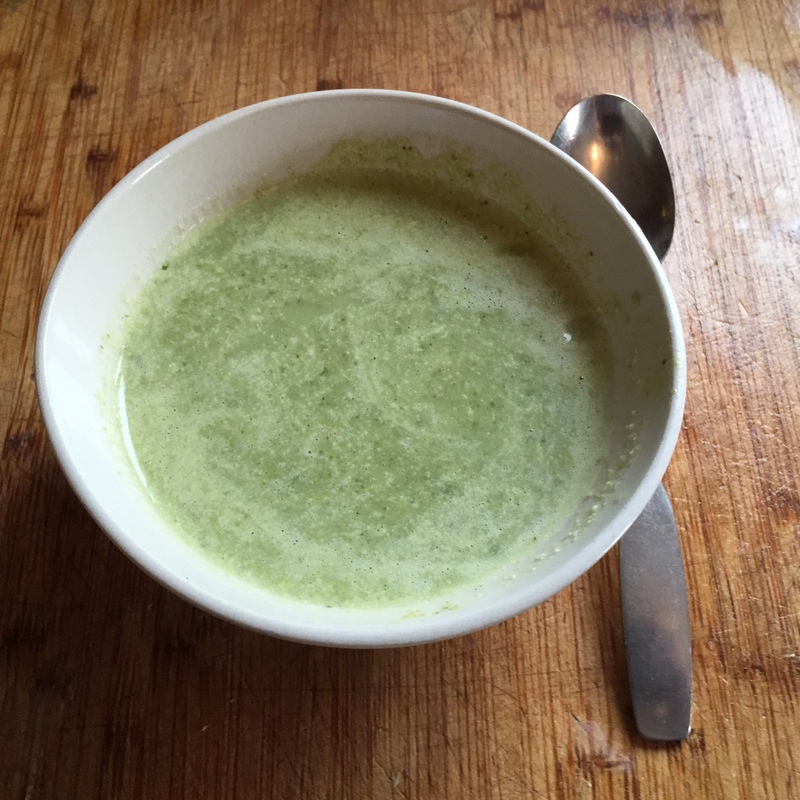 There are a lot of Broccoli Soup recipes out there and many of there are delicious. I’ve made a number of variations myself over the years. Here’s one I made today that went over well. 1 15 oz. can of white beans, drained and well rinsed (just about any kind work or use a couple cups of freshly cooked beans). Heat olive oil in a soup pot and then saute the onions and garlic for a few minutes until soft. Add the white beans and heat a few more minutes. Remove from burner and let cool a few minutes. With an immersion blender, puree the soup. You can also puree in a regular blender and work in batches. Add the cheese and cream. Heat a couple more minutes and then serve with crackers, crusty bread or toasted garlic bread. 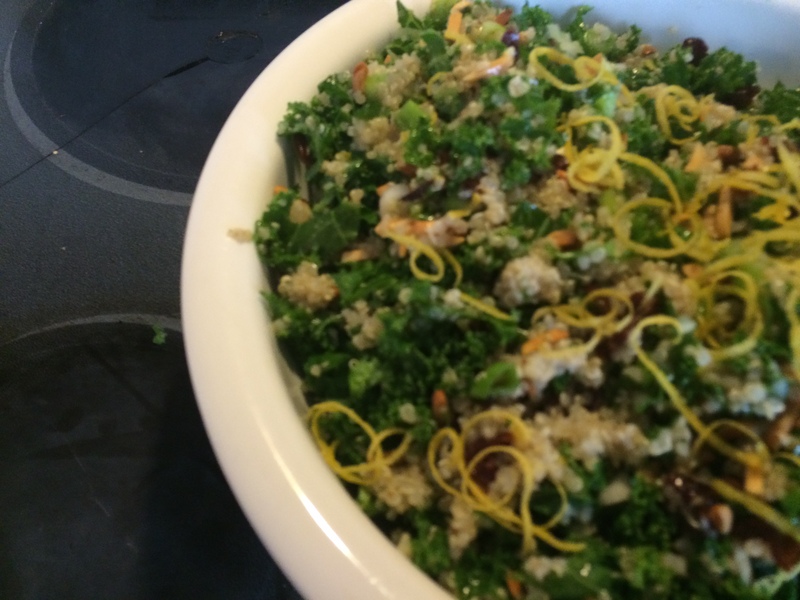 A salad on the side can complete the meal or serve as a side with a main dish. Not much to say about this soup except that it is TOTALLY awesome. I had posted a link to the recipe on Simply Recipes on Facebook awhile back and it generated a lot of comments. This soup is incredibly easy to make, healthy, and tastes great. I tweaked a few ingredients from the original. The spices are essential to this soup, so please don’t skip them! Heat the olive oil and butter on medium heat in a soup pot (8 qt). Add the garlic, onions, and spices. Cook until onions are softened, 5-6 minutes. Add the cabbage to the onions, stirring to mix. Sprinkle with the sea salt. Add the tomatoes and juices to the onions, again stirring. Add the chicken broth. Stir and bring to a simmer. Cover and cook 25-30 minutes or until cabbage is thoroughly cooked. 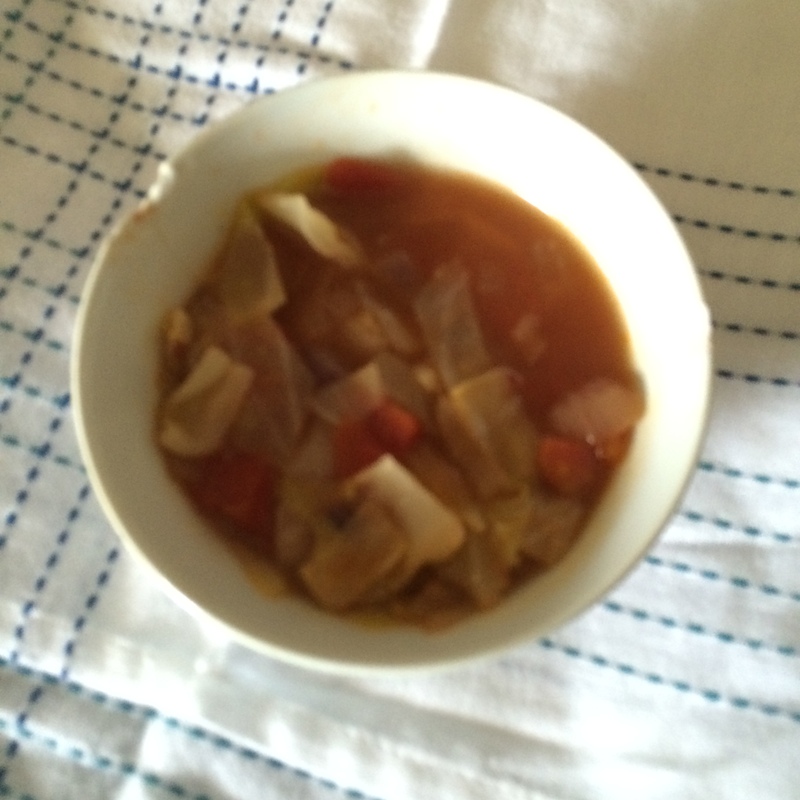 If soup is too thick, add additional water or broth. This is a light soup. I have sautéed some sliced Andouille sausage for users to add to the soup at their discretion. My husband likes this addition. I volunteered to bring a dessert for a ladies group that meets in my home town. 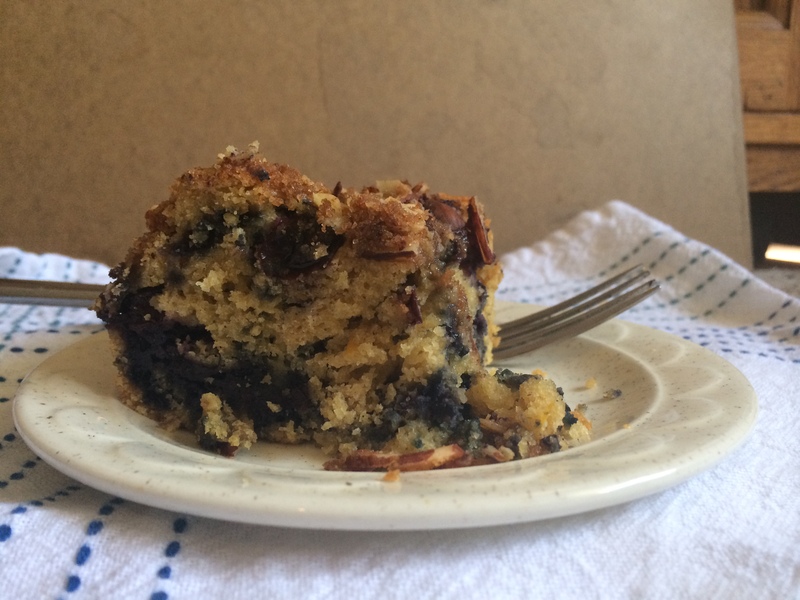 I was going to make my Applesauce Muffins, but then I got my latest magazine of Cooking Light and stumbled across a recipe for Blueberry Coffee Cake that was loaded with blueberries and I was hooked! Made a few minor changes and served it up to family for testing. It was well received. 1/3 cup old-fashioned rolled oats. Wash the blueberries and drain thoroughly. In a small bowl mix 1 Tbsp flour, cinnamon, sliced almonds, and rolled oats. Pour the 2 Tbsp. butter over the dry ingredients and mix. Set aside. In a medium bowl, mix the 2 cups flour, baking powder, and baking soda. Remove 2 Tbsp. of the flour mixture and toss with the blueberries. Set the blueberries aside. In a large bowl, place the granulated sugar, 1/4 cup of butter, and safflower oil. Beat until well mixed. Add the egg and beat well. Add the buttermilk and flour mixture alternately to the sugar mixture. Begin and end with flour mixture. Stir in the lemon zest and juice. Coat a 9 inch square pan with cooking spray. Place 1/2 the batter in the pan and spread out with a spatula. Evenly put 1/2 the blueberries on top. Add the rest of the batter mixture and then top with the rest of the blueberries. Sprinkle evenly with the brown sugar-almond-oatmeal mixture from step 3. Bake at 375 for 45 minutes or until a wooden toothpick comes out clean. You may need to use the outside edges as there are so many blueberries that the toothpick always comes out pretty messy :-). I use the outside edges for the toothpick and then bake a bit longer to accommodate for the middle of the pan. Cool in pan for 10-15 minutes on a wire rack. Loose around the edges with a knife and remove from pan if you wish. I haven’t tried it yet, but did think that substituting raspberries or blackberries would also be good — or even a mixture of berries. Serve with ice cream or whipped cream if you wish. Hope you enjoy this as much as we do!